The Second A3 Roundtable Meeting on Asian Chemical Probe Research Hub in Hangzhou during November 23rd to November 26th in 2017 provided me multidisciplinary knowledge, interesting ideas, and worldwide connections. After attending the First A3 Young Scientist Meeting at Tohoku University on July 12th in 2017, I was glad to get an opportunity to participate in A3 meeting in Hangzhou. 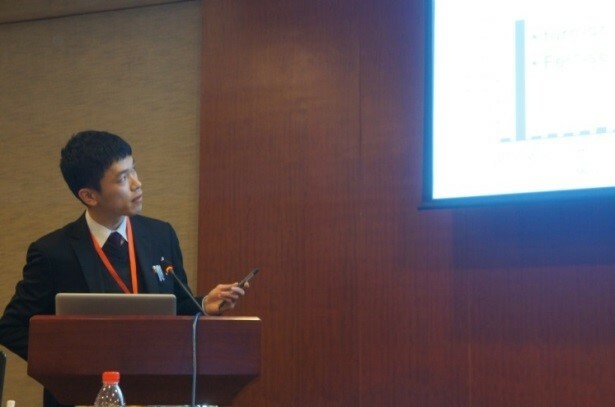 The topic of my presentation was “Development of a membrane-anchoring Fe(II) fluorescent probe”. First, I introduced about the importance of iron in living system. Next, I presented the molecular design, synthesis, and evaluation of a plasma membrane-anchoring fluorescent probe for Fe(II). I also reported the application of this probe to visualize labile Fe(II) during the direct transport or the transferrin-mediated processes in living cells. After my presentation, I had several questions about the application of the probe to the live-cell imaging. Although I couldn’t answer one of them completely at question time, we were able to discuss it well during a tea break. I believe these valuable questions and comments will have a positive impact on my research progress. Moreover, it was very meaningful to be able to discuss the experimental progress and future plan of our experiments with the research collaborators who are members of the A3 meeting. Besides the above mentioned experiences, I was really excited to hear the outstanding presentation by the leading scientists from Asian Countries. It was impressive that one professor talked about the difference between “publishable chemistry” and “useful chemistry”. He referred to the necessity to develop the practical chemical probes to promote collaborative research. In this message, I was encouraged to make more efforts to improve the quality of my research. Furthermore, I was very fortunate to participate in this meeting and to have a worldwide connection with students from China, Korea, and Japan. We talked about on our research topics, daily life, and future design. I want to continue this international network in the future and I would like to contribute to future cooperation by further self-improvement. Through this meeting, I came to understand that Asian countries play an important role in the field of Chemical Biology. I hope A3 platform accelerates international collaborations which will enhance presence of Asia in the fundamental scientific research. I’m sure that, as with my experience, the Third (Korea) and Fourth (Sendai) A3 Meeting will provide young scientists an international connection platform and a chance of self-innovation. At last, I would like to thank A3 foresight program (program leader: Prof. Ueda, Tohoku university) to support me to join in this meeting.